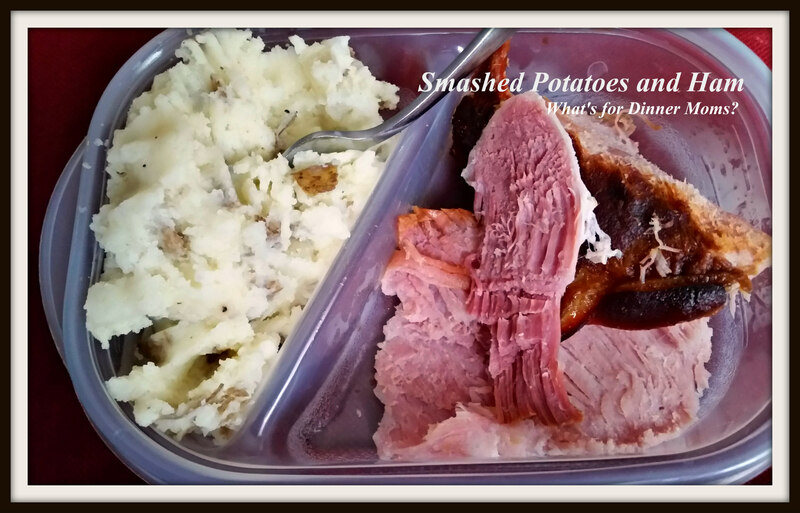 Smashed Potatoes with Roasted Ham – What's for Dinner Moms? Our To-Go dishes made an appearance again the other day as we dashed out to head to a conference for my son. Both kids were hungry so I put together something they could eat easily in the car. The ham was delicious but the real star of the meal is what my children call Smashed Potatoes. I think they should probably be called Heart Attack Potatoes but they are delicious! We think that the Smashed Potato side dish will bring down any house. With butter, sour cream, garlic, and Parmesan cheese? The flavors are intense and out of this world. Both of my children said you should just make a pot of these for dinner one night because that is all we want. That is the problem. I served the potatoes with ham, a green side salad, and a side of green beans. Boil potatoes in a large pot of water until fork tender. Drain potatoes and immediately return them to the pot. Add butter, sour cream, Parmesan, and garlic powder to potatoes. Smash with a fork or potato masher to desired consistency. If too thick add a bit of heavy cream to potatoes until desired consistency is reached. Taste and adjust spices – garlic, salt, and pepper to your liking. Serve potatoes while still hot. Sounds delicious! I’ll have to try the Smashed Potatoes. Thank you! My kids ❤ them! This would could work with a ham steak as well!!! So hungry!!!!! Reblogged this on Just a Blog About Food. I love it when I have leftover ham in the freezer! It makes for such a simple weeknight meal. The smashed taters look yummy!